Marin Cilic is the youngest men’s Slam winner. He turned 30 on Friday. Happy 30th birthday, Marin Cilic! 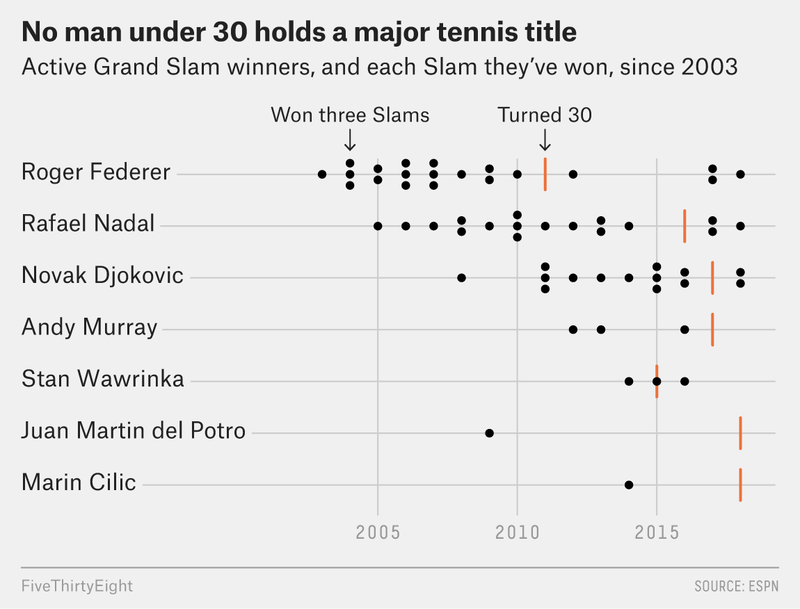 Don’t worry about feeling over-the-hill: You’re still the youngest Grand Slam champion active on the men’s tennis circuit — the most unexpected, and improbable, phenomenon in the sport’s history. For the first time ever, male pros ages 30 and up own all the major singles titles won by currently active players, according to data since 1930 from the ATP World Tour. There are seven active men in all who have won major titles: Roger Federer (age 37), Stan Wawrinka (33), Rafael Nadal (32), Andy Murray (31), Novak Djokovic (31), Juan Martin del Potro (30) and Cilic, who won the U.S. Open four years ago and turned 30 today. Together, those men have won 59 major titles dating to Federer’s first in 2003, at Wimbledon. Overall, this elite group of men own 16 majors at Wimbledon, 15 at the U.S. Open, 14 at the Australian Open and 14 at the French Open. The field still under 30 can boast of nothing better than losing in a major final to the current champions. Even more absurd: The male winners of the past nine major titles have all been in their 30s — and in fact they were all at least 31. The next longest streak of major titles won by 30-somethings happened in 1969, when Rod Laver set it by himself, winning all four major titles at ages 30 and 31. 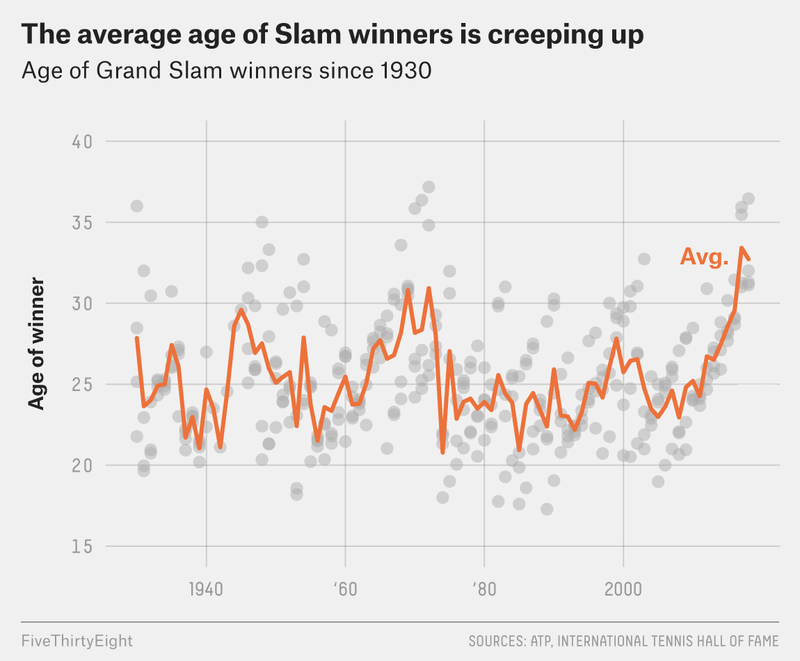 Other than that, every season from 1925 through 2016 had at least two Slam winners under 30. Men’s tennis never used to be this way. The winners have usually been young and dominant. From 1955 through 1966, men under age 30 won 48 consecutive major titles, the longest streak on record. Younger men continued to dominate for dozens of years, which made sense: Tennis is a taxing sport that requires speed, power and stamina. In modern tennis, the best players — men like Laver, Ken Rosewall, Pete Sampras and Andre Agassi — have won major titles in their 30s. But it didn’t happen that often. After Agassi, then 32, won his last major title at the Australian Open in 2003, talented youth — and especially Federer — took over. Players younger than 30 won 37 straight major titles until Federer won his first over-30 major at Wimbledon in 2012. The young still ruled after that, with Nadal, Djokovic and Murray winning most of the titles. But then a funny thing happened: Federer and his younger rivals, Nadal and Djokovic, kept thrashing opponents and winning majors, no matter their ages. Federer, Nadal and Djokovic have continued to dominate tennis among the players still active, winning the last eight major titles (that’s two years). Overall, Federer has won 20 major titles, while Nadal and Djokovic have won 17 and 14, respectively, for an improbable pile of 51 majors. Before them, only Sampras had reached that level of dominance with 14 Grand Slam wins, which was a record until Federer broke it. Some who have watched this unprecedented run wonder if the younger players are weaker than usual. More likely, three all-time-great champions — Federer, Nadal and Djokovic — have randomly risen up in the same era. They’re also likely motivated by their rivals’ achievements, using the others’ wins as inspiration to improve their tactics, technique and conditioning. This unlikely occurrence can’t last forever — a man born in the 1990s has to win a major one day. But don’t be too surprised if this continues for a while, even another year, as long as Federer, Nadal and Djokovic remain healthy and Murray fully recovers from his hip surgery. Djokovic, who has won the Australian Open six times, will be the favorite there in January, and Nadal might well be in shape for his 12th French Open title. That would bring this wild period of 30s dominance to 11 straight majors. But whatever happens, the chance of any generation matching this accomplishment in the future is slim — and perhaps impossible. Tom Perrotta is a tennis writer based out of Brooklyn and frequent contributor to The Wall Street Journal.